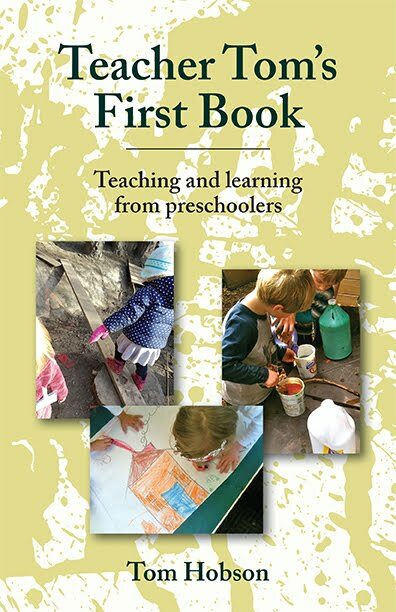 Several years ago, a teacher from the city Reggio Emilia, Italy, a place renowned for it's namesake child-centered approach to early childhood education. I was, of course, flattered that she chose to visit our school and I proudly showed her around. I am familiar with the Reggio Emila approach, but I'm far from an expert, a fact that I readily confessed to her. "Oh that's normal. I've met many Americans who say their schools are Reggio Emila schools, but they aren't." I nodded understandingly, pursing my lips to indicate that I felt this was "too bad," but that's not where she was going. "They aren't Reggio Emilia schools because they are in America. How can they be Reggio Emilia? Why would they want to be? Your school is a good one, Teacher Tom. It's in Seattle. It's Seattle school." She had put her finger on something that I instantly knew was important to me, even if I'd not up to then been able to articulate it. Reggio Emila schools are community-based schools that reflect the geography, culture, and people who live in that community. 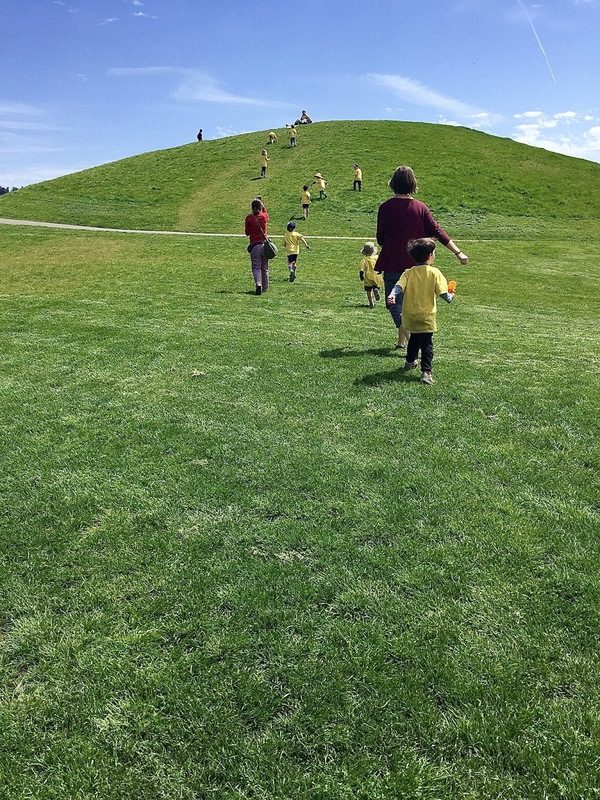 Our school is a community-based school that reflects the geography, culture, and people who live here. 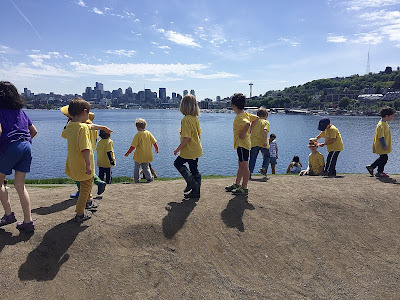 Indeed, it's even more narrow than Seattle: our school is a product of the neighborhood of Fremont and environs, The Center of the Universe, and the families who have chosen to raise their children here. Of course, I can learn and be inspired by the work they do in Reggio Emilia or anywhere, but our school, as should be true of all schools, is a product of the soil from which it grows. You could not transplant it elsewhere and expect it to thrive. I've had the opportunity to travel quite extensively over the past few years, visiting dozens of amazing schools along the way. 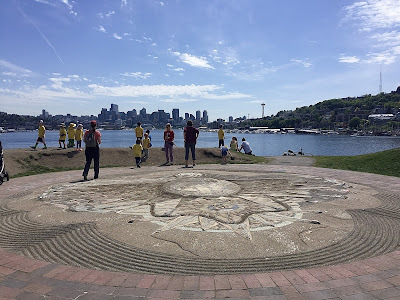 At every stop, I've seen things I envy, that inspire me, that get me thinking, but not once have I been able to directly translate what I brought back to Woodland Park without adapting it, often extensively, to our "Seattle school." 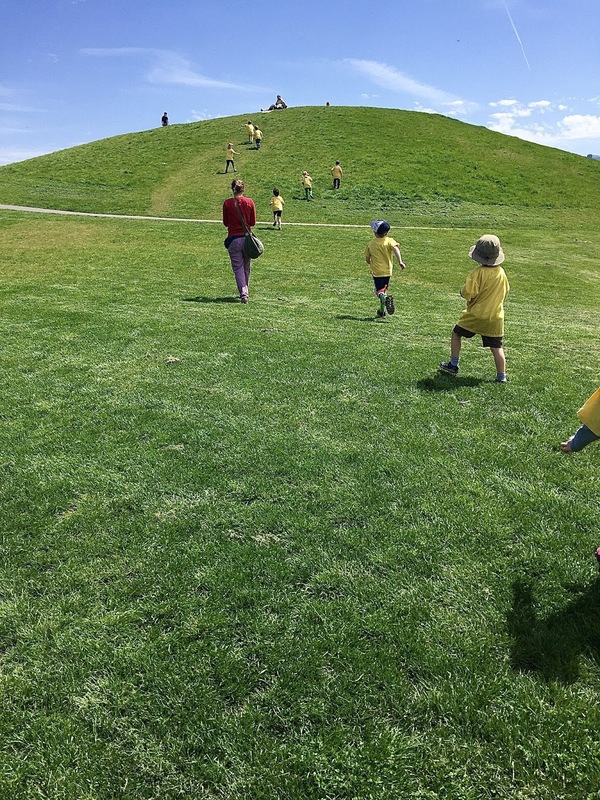 We are a school located in one of the most densely populated parts of the US, an urban school with a playground the evokes a vacant lot, noisy, and robust. Our wildlife are rats, raccoons, squirrels, and the down and out folks who are cared for by Pastor Gay. We can walk to breweries, cycling is a regular mode of family transportation, and naked people fill the streets for the Summer Solstice. There are seaplanes overhead, drawbridges underfoot, and a troll living in the shadows of State Highway 99 that arcs above us across the Lake Washington Ship Canal. It rains a lot, people use the buses and trains, and there are a lot of hills. The families who make up our school are choosing to raise their children here. This is where we go to school. This is where we learn to play together. This is our geography, culture, and people. 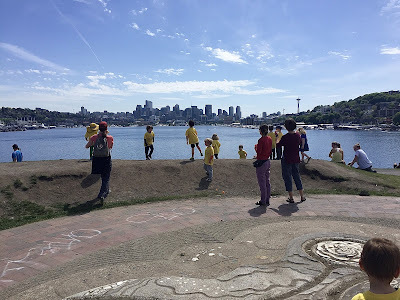 Last Thursday, we went to Gasworks Park to fly kites. We had made our own paper kites, what I think of as "running kites," as well as a few "San Francisco kites" (string tied to plastic shopping bags). 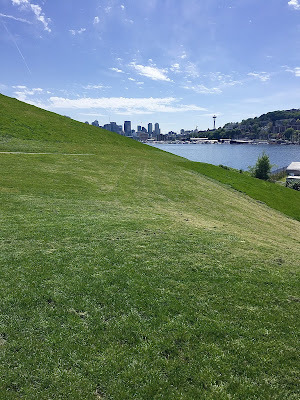 Gasworks is in our neighborhood. We figured it would take our crew of nearly thirty about a half hour to make what normally would be a twenty minute hike. We could probably do it faster if we stuck to the main roads, but we opted for the Burke-Gilman trail, a nice multi-use track along the ship canal, largely segregated from car traffic. All the kids have walked Burke-Gilman before. They know that cyclists sometimes try to bomb through there, even if some need to be regularly reminded to watch for bikes. 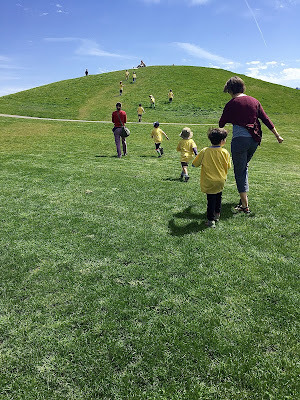 In our yellow field trip t-shirts, it didn't take much to imagine us as bunch of mother ducks herding ducklings along, keeping them as best we could to one side to leave a lane for cyclists. There were no incidents; not even any close calls. 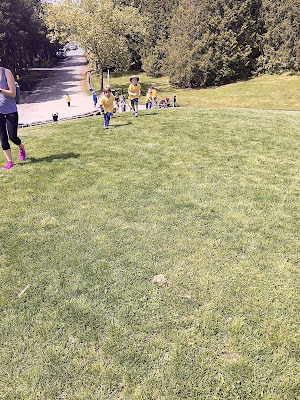 Most of the kids picked dandelions along the way as well as other weed flowers, decorating themselves or just carrying them for a time. 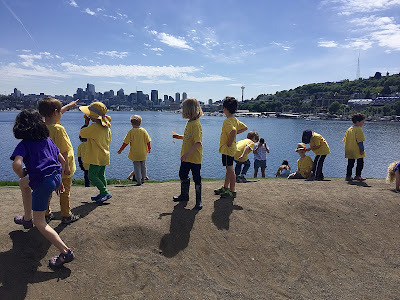 Doing this, walking the Burke-Gilman together, watching for bikes while picking flowers is our Seattle school. 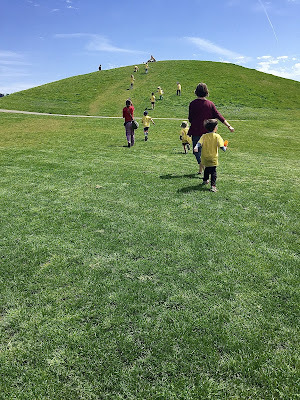 Once at the park, we ran for the "Great Mound," a steep, man-made grassy hill with a sundial on top. There is a zig-zag path, but we chose the most direct route. It's been a record-breaking winter here as far as rain goes and this just happened to be a warm, sunny break. Children are not known for taking in scenic views, but this one captured them all as they stood together for a time, just contemplating downtown across Lake Union, spotting the Space Needle and counting construction cranes. There is almost always some wind in Seattle, but not this afternoon. 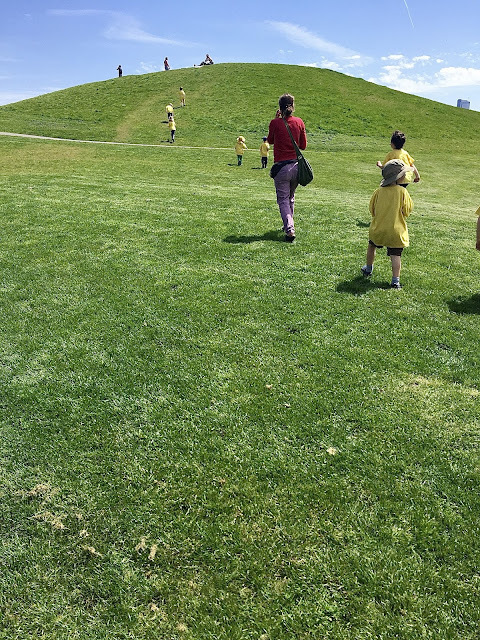 The kids didn't care as they just held their kites high and ran pell-mell down the hill, feeling the resistance as they ran. No one appreciates a freshly scrubbed sunny day the way we do in our Seattle school. It was barely 70 degrees, but after an hour or so some of us were beginning to feel overheated. Gasworks Park is built on the site of a former synthetic natural gas plant (I know, "synthetic natural gas?"). We decided to pack up and cross the park, past the skeleton of the defunct gasification facility, to the large picnic shelter that houses a collection of esoteric factory parts. Sadly, it's off limits for climbing which rendered them useless for our purposes, so we moved off into a little amphitheater-like area behind the shelter: a bowl of grass surrounded by a "forest" of cedars. I once heard an interview with Richard Haag, the landscape architect who designed Gasworks Park. He describe it as a sacred space, ringed by trees on one side and the lake on the other. If feels like a natural place even though both the park and the lake itself are largely the product of human art and engineering. One of the parents tried to slowly, slowly sneak up on a goose with her goslings that we discovered grazing on the lawn. When children ran to find out what she was doing they frightened the geese, but then we figured out how to slow down so we could get a nice long look at those cute babies. Our Seattle school is found in these natural-not-natural places. The adults had anticipated that kids might be too tired for the hike back, which includes many blocks of uphill, so we were prepared to take the bus, but everyone seemed game so we hoofed it back toward school, sticking to the streets this time in the interest of speed. We stopped at a lot of crosswalks. Our big group was often separated at short lights, so those of us in the front would wait across the intersection for our friends. Gever Tulley once coined the term "dangerism" to refer to those hazards we simply accept in life. For the Inuits, for instance, children as young as 3 regularly use very sharp knives to cut blubber from seals. In our culture, we raise our children around traffic, far more dangerous than sharp knives I would think. When I watch these kids, they are, for the most part, quite expert around traffic, cautious without being nervous, cognizant of the hazards without being fearful. Learning to live with traffic, which is an important aspect of our Seattle school. There was some bellyaching as we bent our backs to the final hill, the worst of which was when we turned onto Troll Way, but the visage of The Fremont Troll lurking under his bridge, perpetually devouring a VW Beatle, spurred us homeward. "I see the Troll!" "It's the Troll!" "Hi, Troll!" Back in our vacant lot playground, the kids found a second wind, launching themselves into the sand and swings. It was such a normal day for us, boring even. It had been almost like a refresher course as we went out there into The Center of the Universe, together, and practiced living here. It's our Seattle school.